Here is a repost since the last thread was spammed and deleted. Reserved for parts list, cost, links & other info. Freeze Plugs 381-3179, $11 for a 12 pack at Napa required. Depending on the style you want to do, there are different methods. The most basic method is not angling the baffles at all. 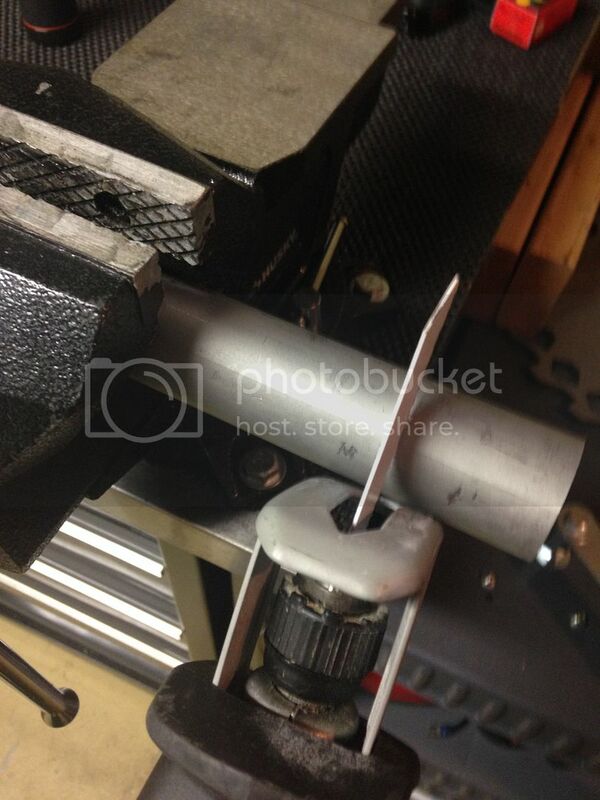 You just use the centering tool and a drill to drill the middle to the desired caliber. I will be testing non angle baffles, 45 deg angled baffles and 60 degree baffles. I may test different combinations of the baffles as well, along with different spacing arrangements. Puller tip 45 degree, required if adding an angle to baffles. 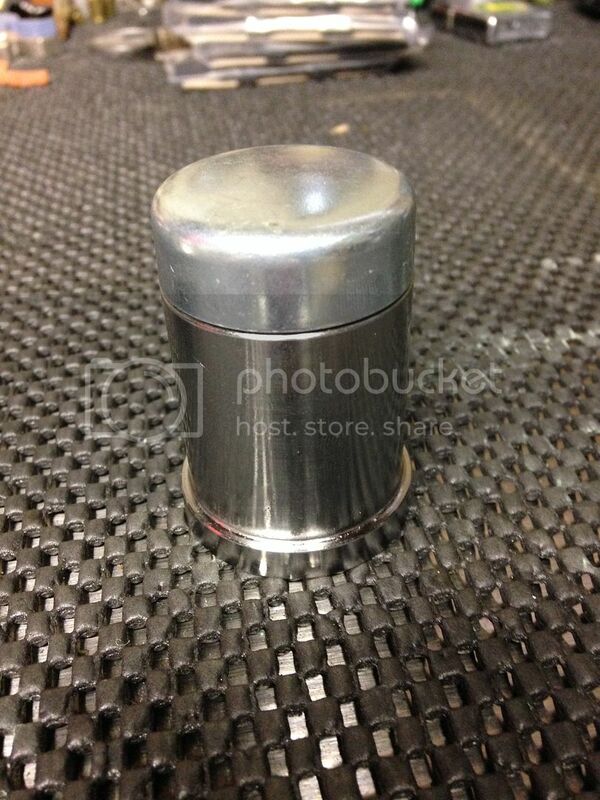 If you don't have a puller to use the tip off of, there are replacement tips online for $10-$15. And then there is a complete setup, it forms perfect consistent baffles over and over again, and gives you a perfectly centered bore. The price is perfect and well worth the investment. There are two brands of baffles that I have found will fit. This is the one I linked to above. 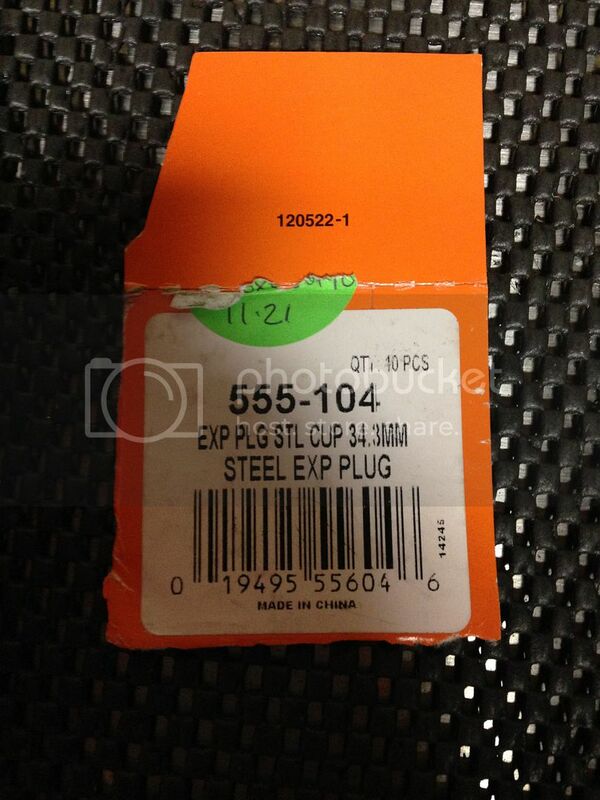 This part number is stronger and slightly longer in the depth. They also fit tighter in the tube, and require just a slight bit of pressure to push down the tube. These may create a better seal, but either will work just fine. Last edited by Weber; December 29th, 2015 at 07:27 AM. 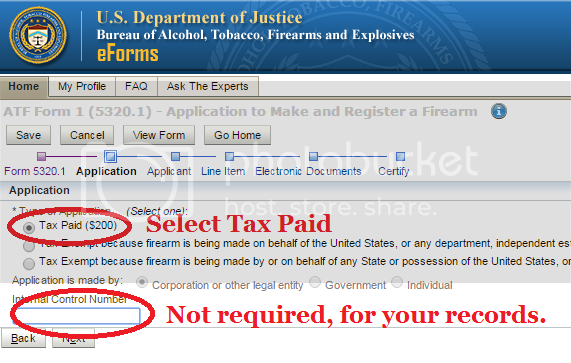 Step 1: E-File form 1, and pay $200 tax. 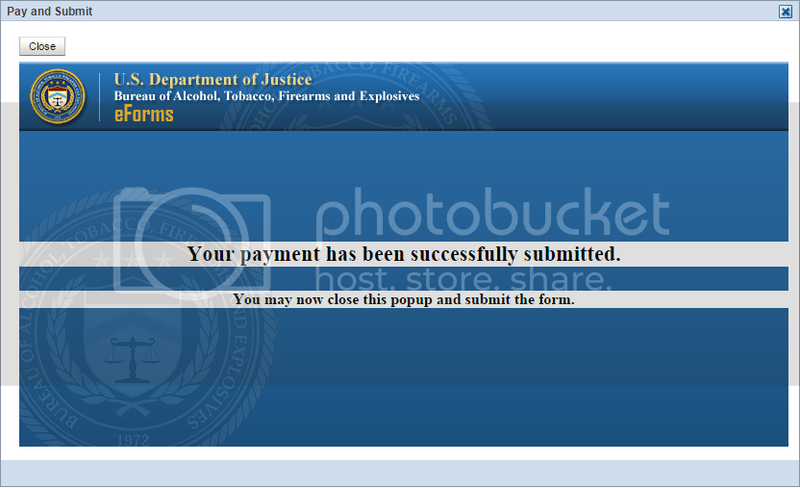 Step 2: Impatiently wait for your approved stamp... This stamp took 41 days to be approved. 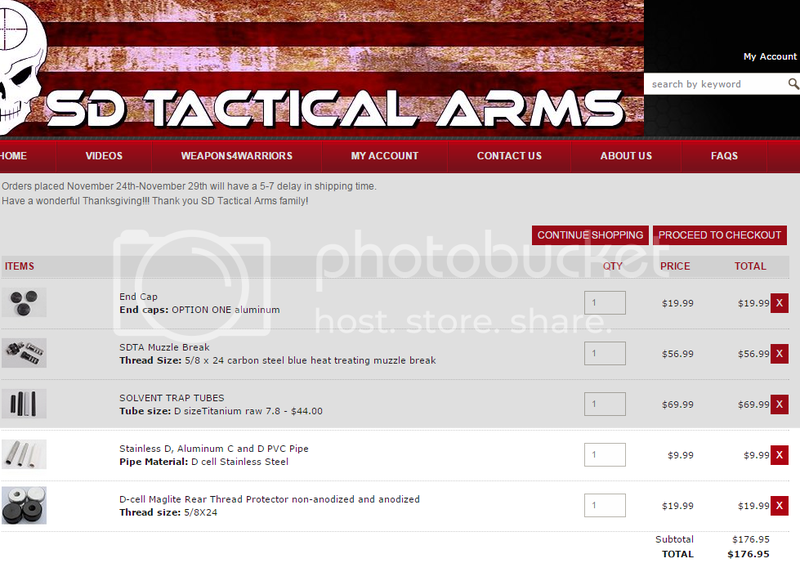 Step 2.b: Order the parts and pieces (see list above post). Step 3: Form Baffles. There are many methods for this, I tried most of them. My preferred method that results in the most consistent baffles was using the tool and die to form the angle. I was able to do this with a vice, but was pretty tough to do. It felt like any second the vice handle was about to break. Using a 6 ton hydraulic press made the job much easier. Place a freeze plug on to the tool. 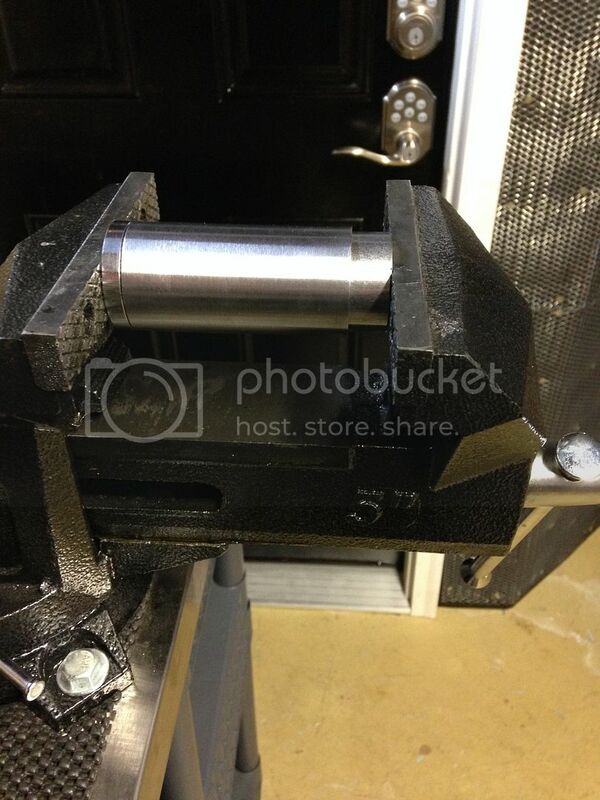 Then place the sleeve over the tool, and insert the die into the sleeve. 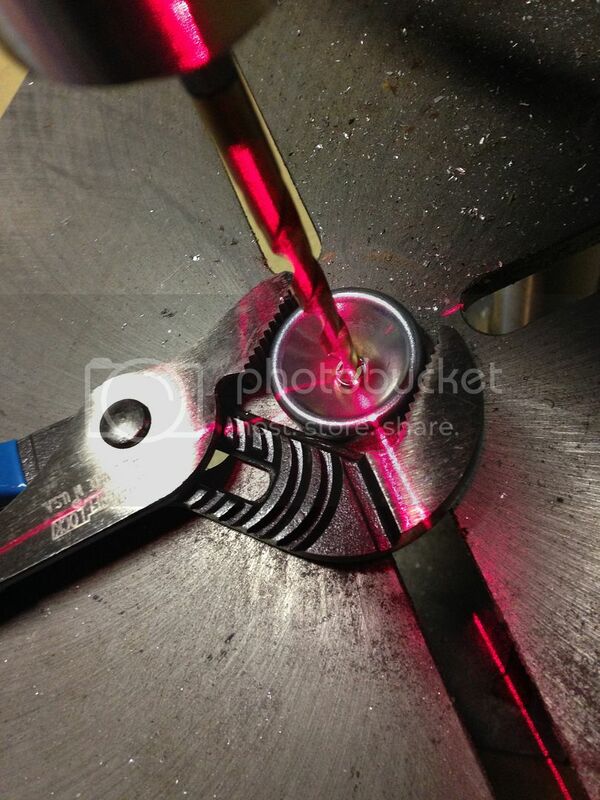 Place the whole tool into a vice and crank it down until you can't move it anymore. Check the angle to make sure you depressed it enough. Here is a before and after photo. Using a press makes the job much easier, follow the same process as above but place the tool under the press instead of in the vice. 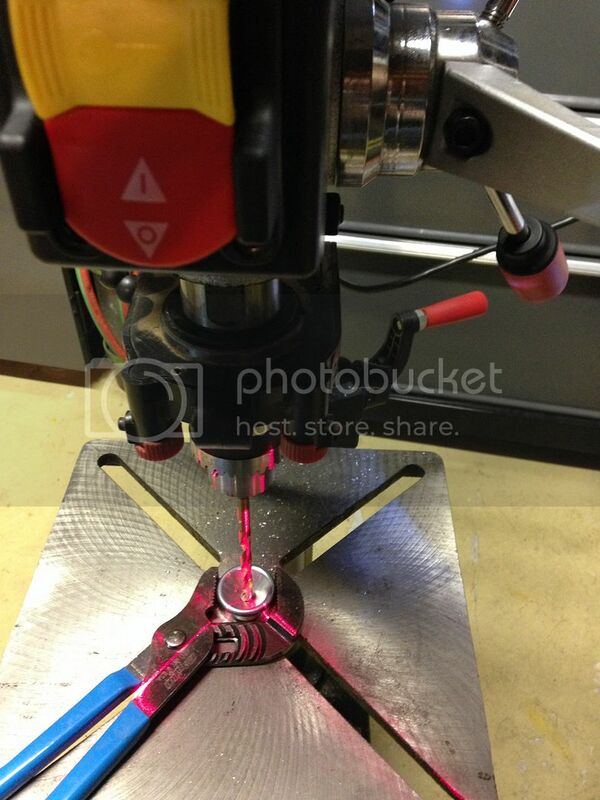 Press the die into the tool, until it reaches max depth. 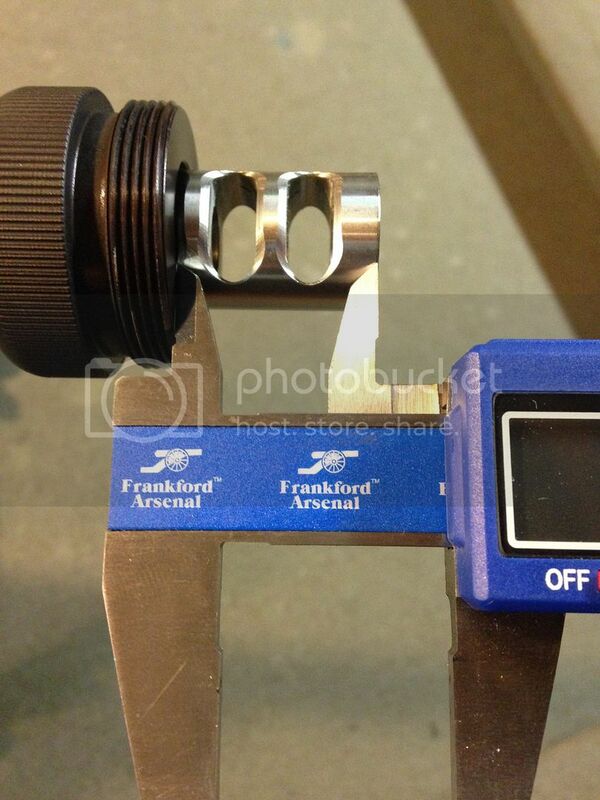 I measure with my calipers the die to sleeve difference to make sure they are all pressed to the same depth. 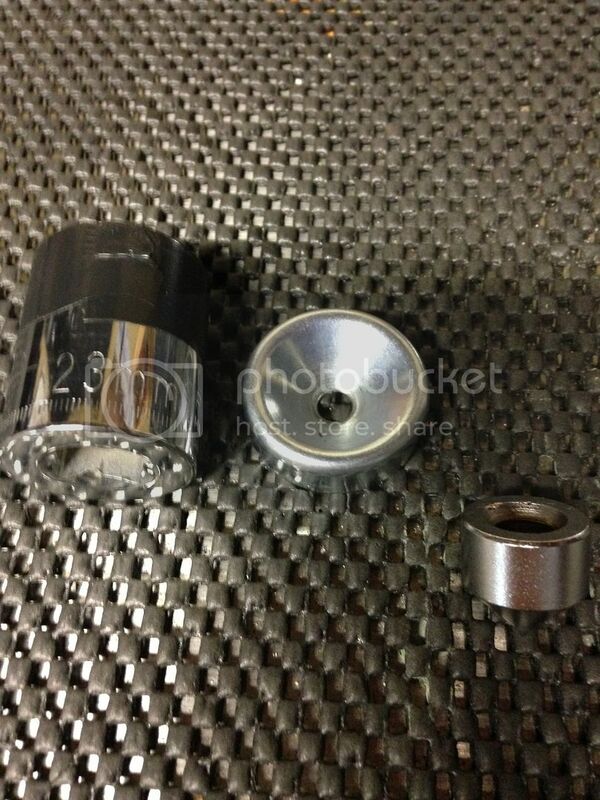 Remove the sleeve and the die, and inspect. Sometimes depending on the plug brand, they may be slightly stuck onto the die body. A slight tap of a hammer frees them easily. 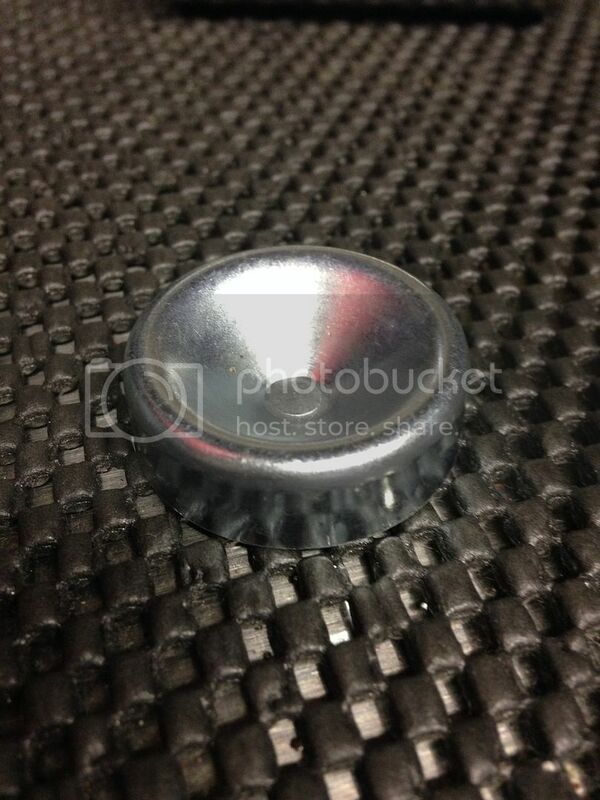 Your finished dented/formed baffle ready to be drilled. This method is for if you don't buy the forming tool I recommend. This method you will need a centering tool (not pictured) from SDTA $20. 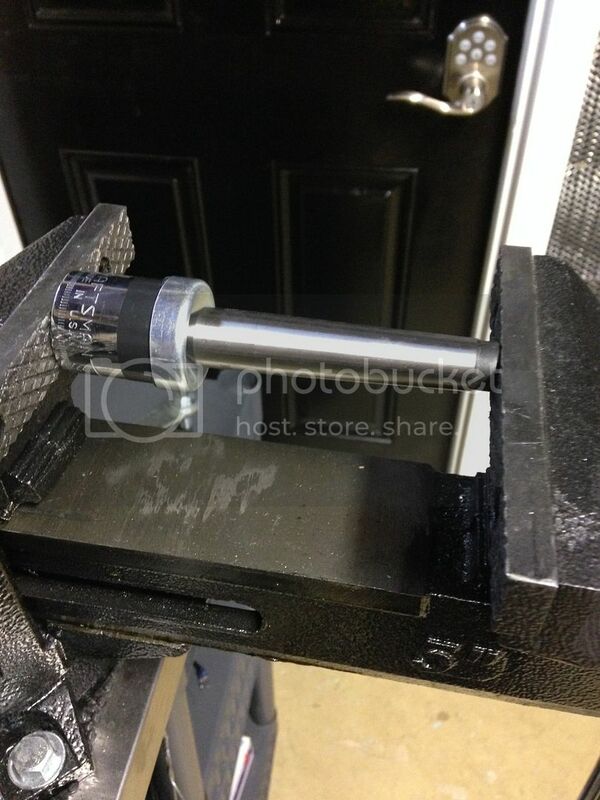 In this example I'm using a 23mm craftsman socket, a 45deg flaring tool center bit, and the 60 deg lathe bit. 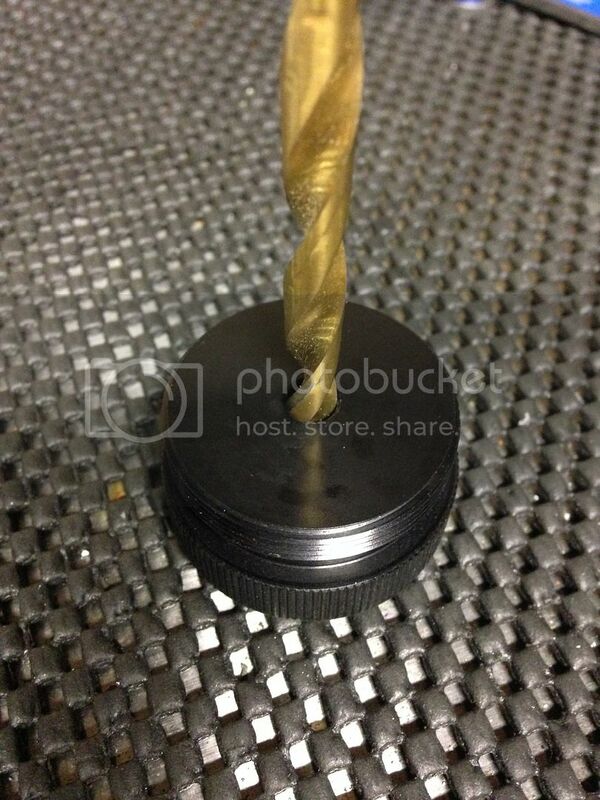 First step in this method is to drill your starting hole with the centering tool. This gives the forming bit a spot to center off. The plug fits over the socket pretty good, but depending on brand it may be slightly loose. If so a wrap or two of tape will make it tight. 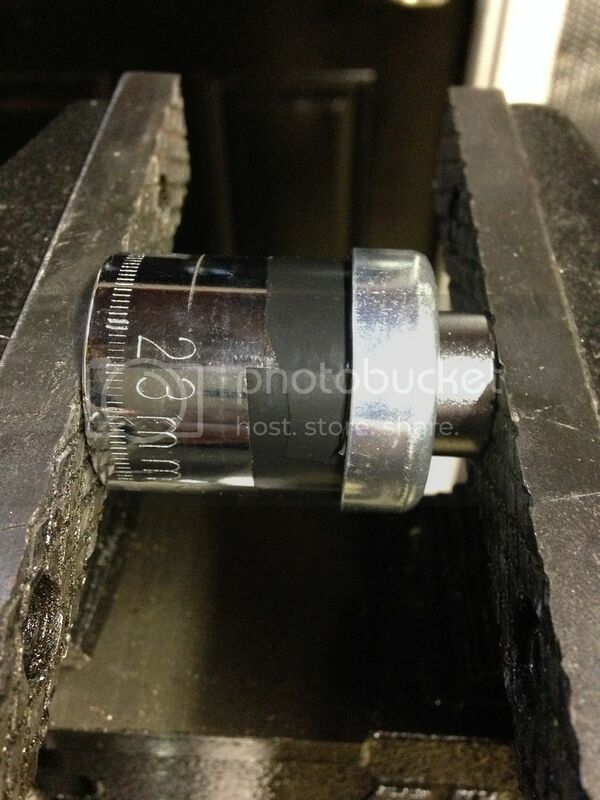 Place the plug over the socket, and align the forming bit in the center and place in the vice. Before cranking down, make sure the everything is square. Tighten down until the bit is touching the plug completely. If you are planing to use the 60 deg angle you will form the 45 deg first, then step up to the 60deg. Follow the same process as above with the 60 deg bit. The center hole will grow as you are forming, you want to make sure this does not get bigger than your desired final hole size. I recommend making it smaller than that size and use a drill but to give you the final size. 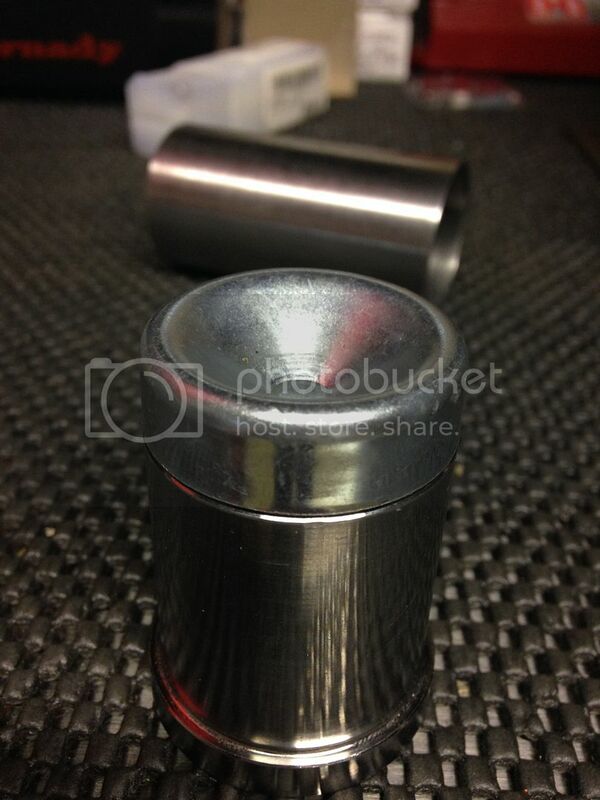 Here is a socket formed baffle. 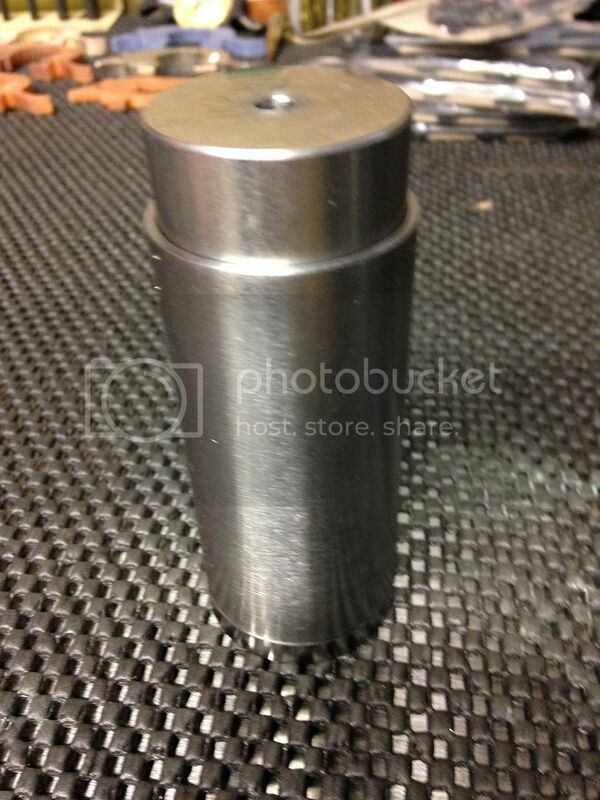 If using the baffle forming tool, you DO NOT drill prior to forming. Form the plug and then drill it. 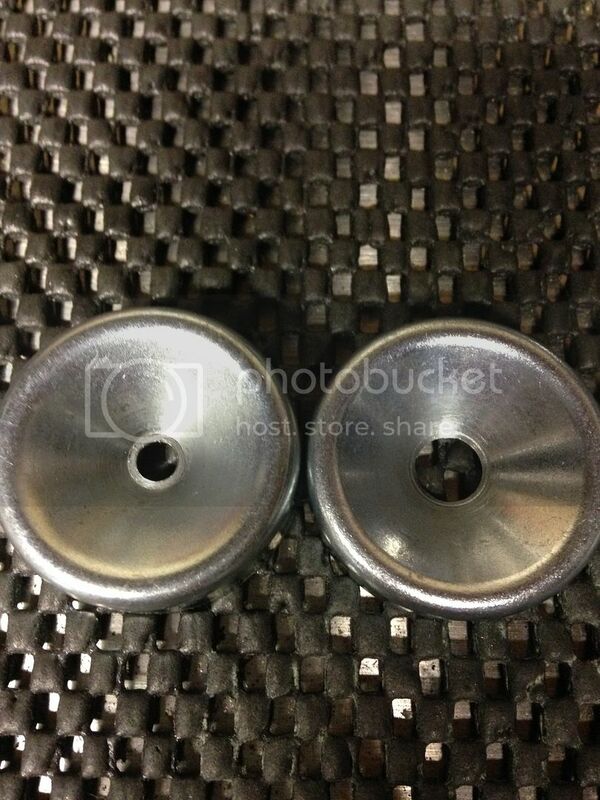 See this picture of two plugs, the plug on the left was formed and then drilled. The one on the right was drilled and then formed. The hole will grow as you form, I believe it is better to form and then drill for consistency and plug thickness. 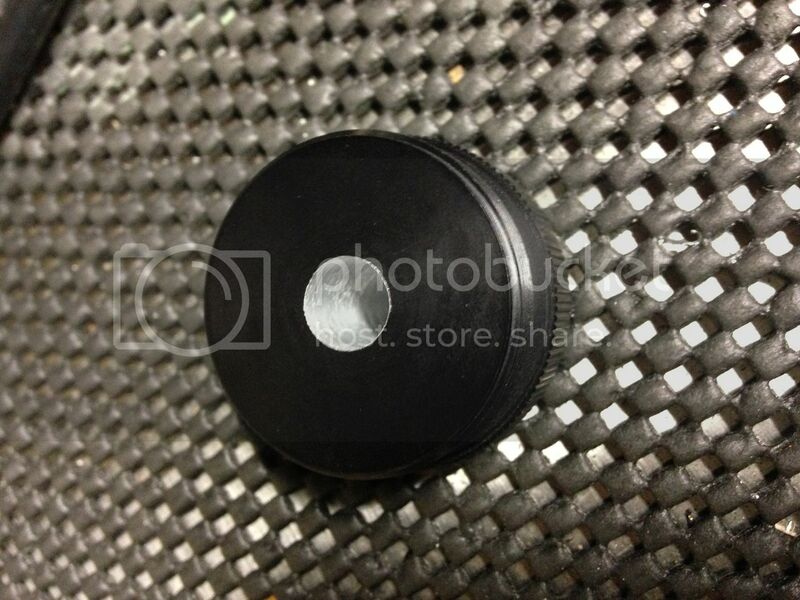 While the tool is in the forming tool, drill your center hole. 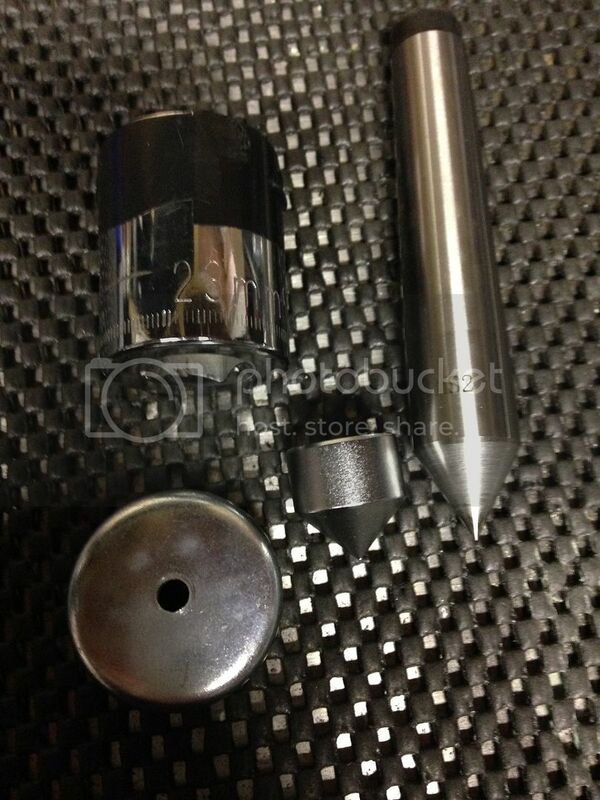 After drilling your center hole with the tool, you now just have to increase to the desired caliber size. For this 30 caliber can .371 would be the size we are looking for. 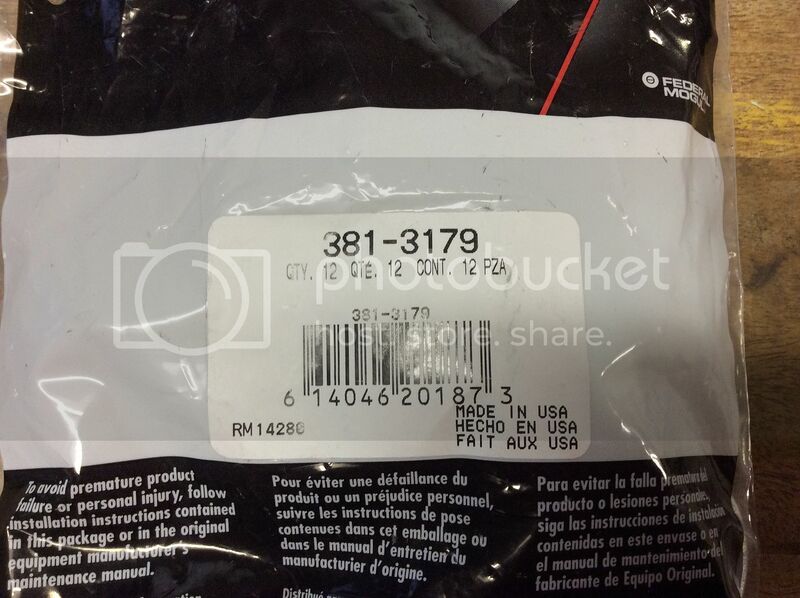 A 3/8 drill bit is .375, you can either order the .371 bit or use what you have. Going slightly bigger is safer and easier, but it will decrease the effectiveness slightly. 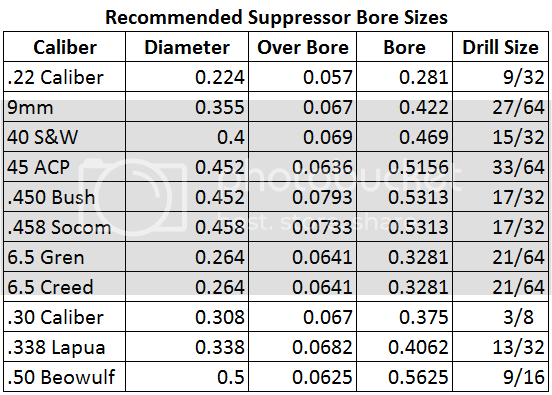 Here is a chart that I have created based on testing that gives the best performance for suppression, safety, and accuracy. I used a drill press to complete the holes. It's important to slowly step up to the final size. This prevents you from getting off center, and gives a cleaner hole. My centering tool uses a 3/16 bit. I slowly stepped up a bit size at a time. Using the drill press and a pair of channel locks, line the center up, the drill bit will center off the smaller size hole. After you get to your desired size, check to make sure they are centered and if anything looks off, destroy it. Freeze plugs are cheap, blowing up your can up is not. 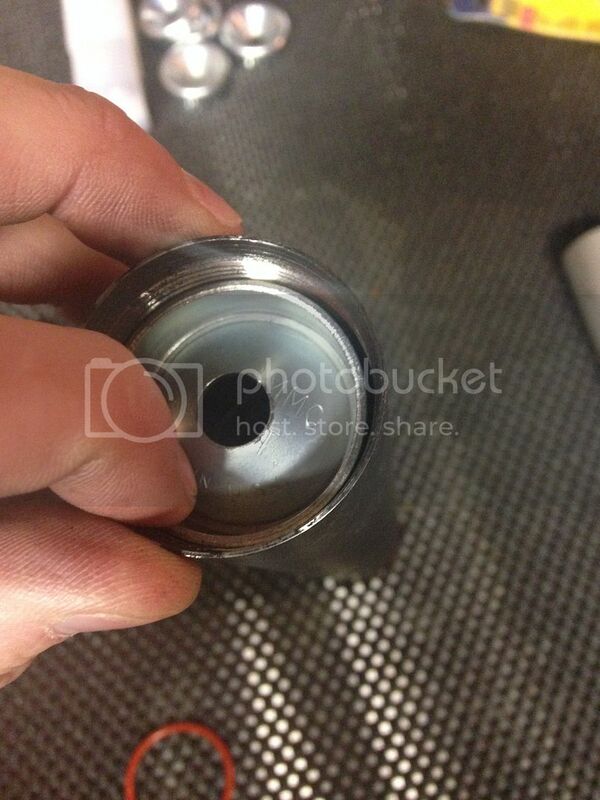 Inspect the hole and clean any burrs off. 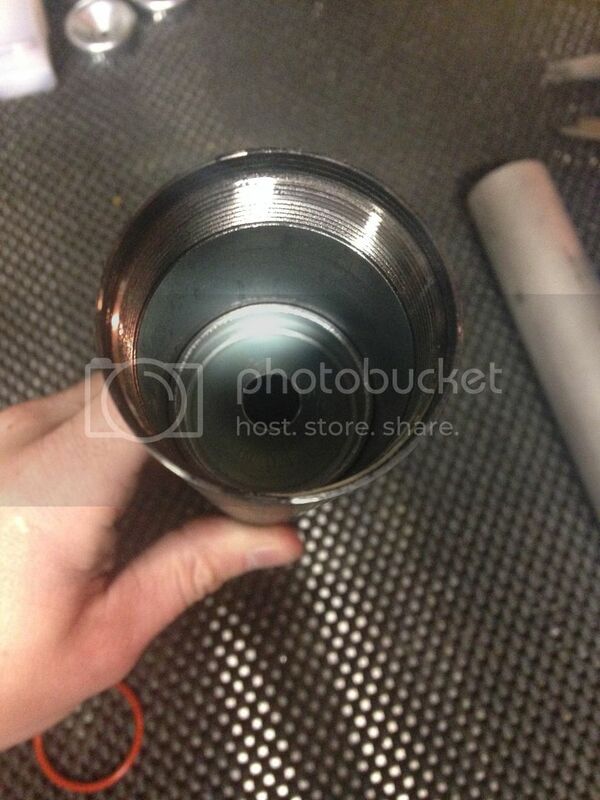 After you have all your plugs done and cleaned up, and everything looks good it's time to drill the end cap. 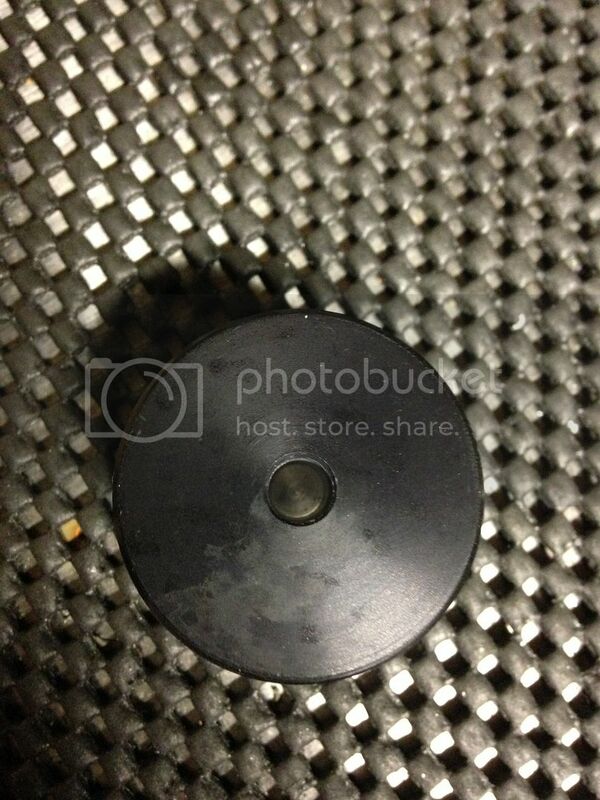 When you buy this from SDTA it will come center marked and the hole is started. First step is to drill the hole they started the rest of the way. This is done just like the plugs on the drill press. 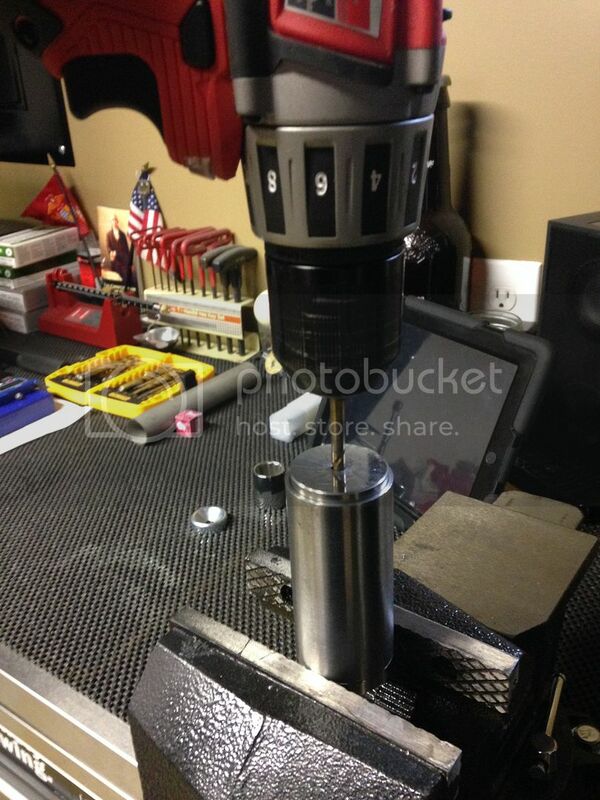 Slowly step up the drill bit size until you get to your desired size. 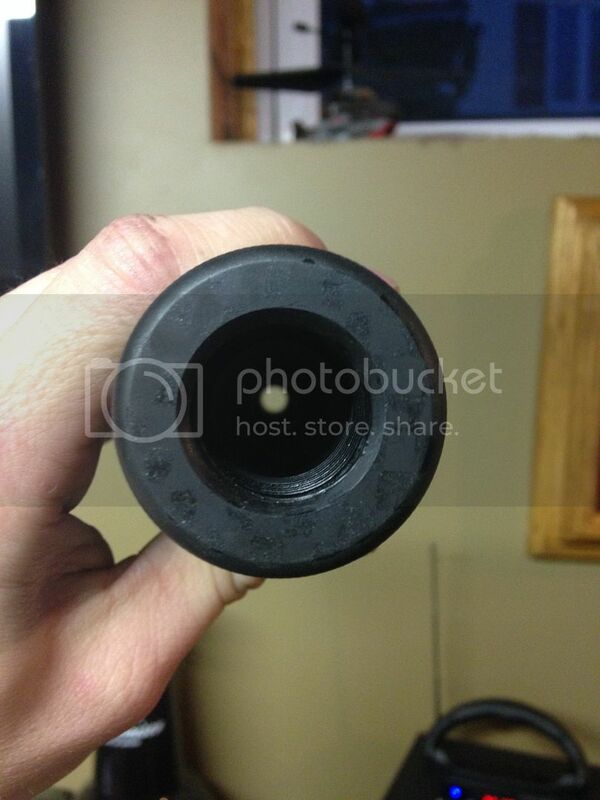 When finished you should have a nice end cap with a clean center hole. Do another inspection of all your baffles and end cap. Everything should be nice and centered, clean with no metal burrs. 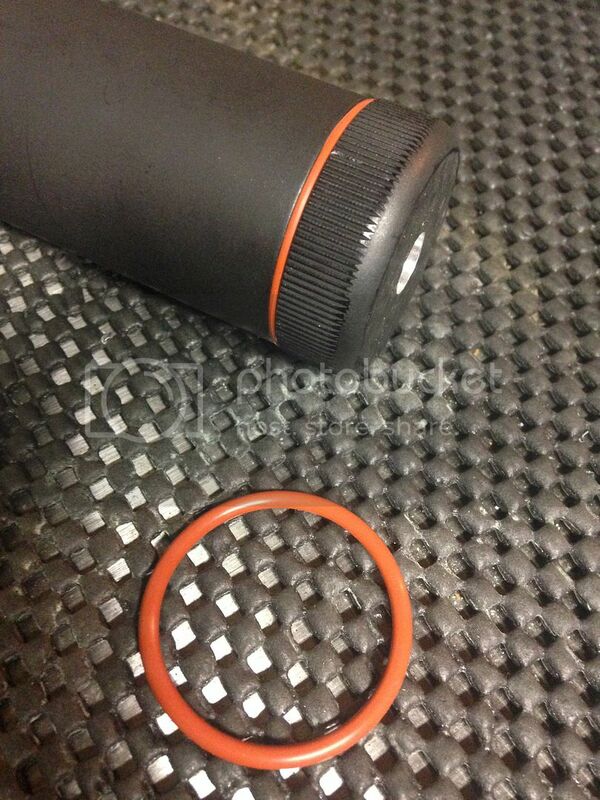 Someone on another forum recommends the use of the high temp o-rings to help seal the suppressor and add resistance to the ends cap. I placed one on the end cap and tightened it down. After finishing the build it was pointed out that the oring should fit inside the tube. It does not on mine. I called SDTA where my parts came from and they do not recommend using them, so I removed them from my build. 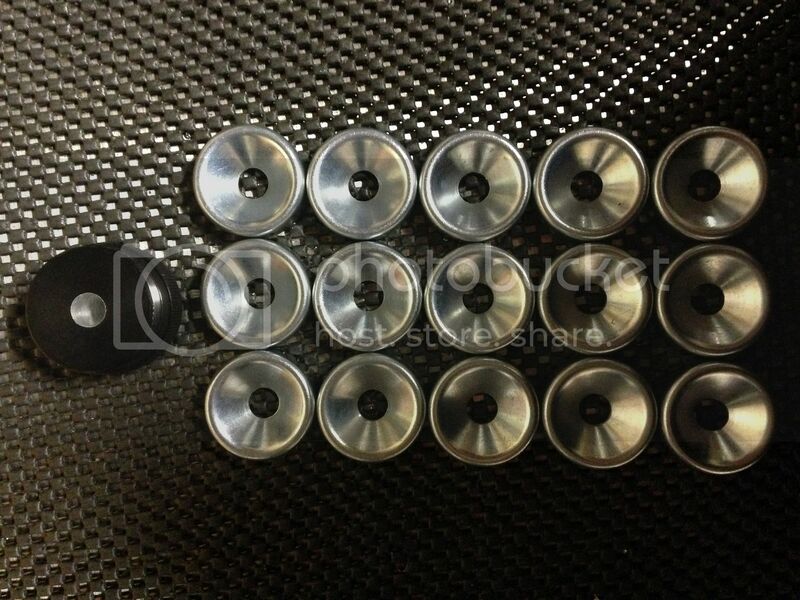 Next install the baffles in the configuration of your choice. Push them down and make sure they are fully in place. Last edited by Weber; December 28th, 2015 at 03:14 PM. The blast chamber needs to be at least the length of your break that the adapter doesn't cover. Install the end cap onto the adapter and measure the length. If your internal measurement (we will do this next) is not at least this long, you will need to remove a baffle or two. 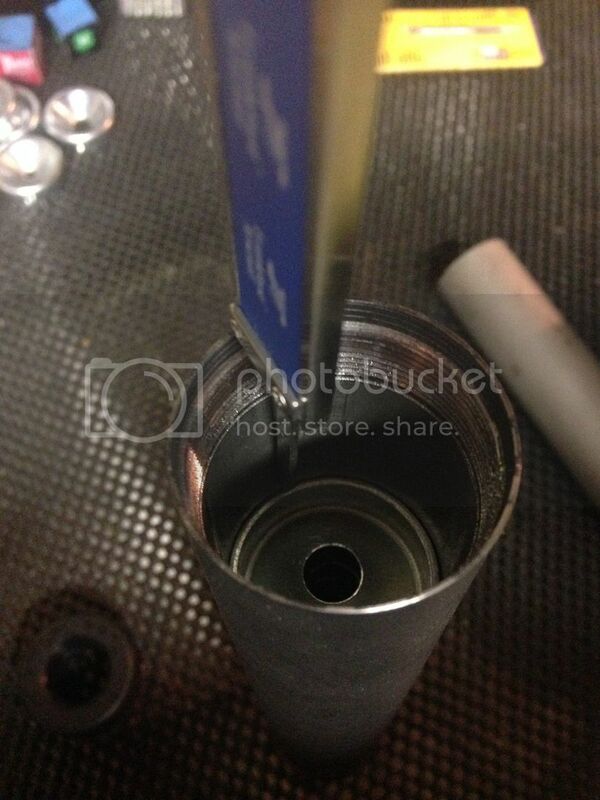 Next measure the distance from the top of the tube, to the first baffle. 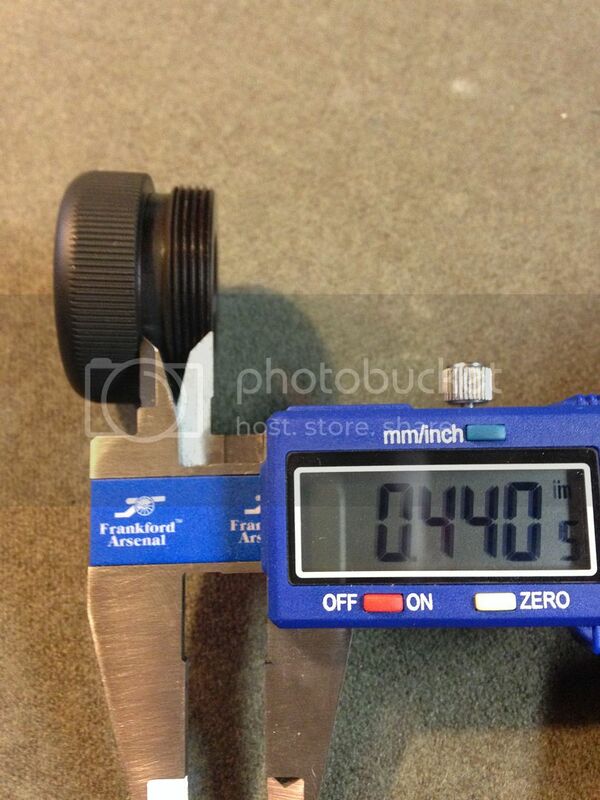 Then measure the distance between the face of the end cap and the o-ring. 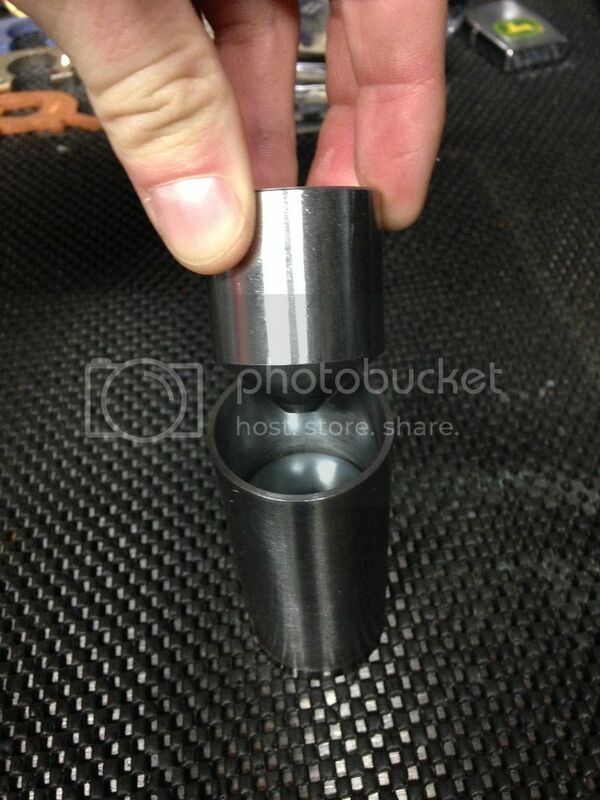 Subtract the two measurements and that is the length of your blast chamber spacer. There are many ways to cut the spacer, just make sure you have a nice clean square cut. 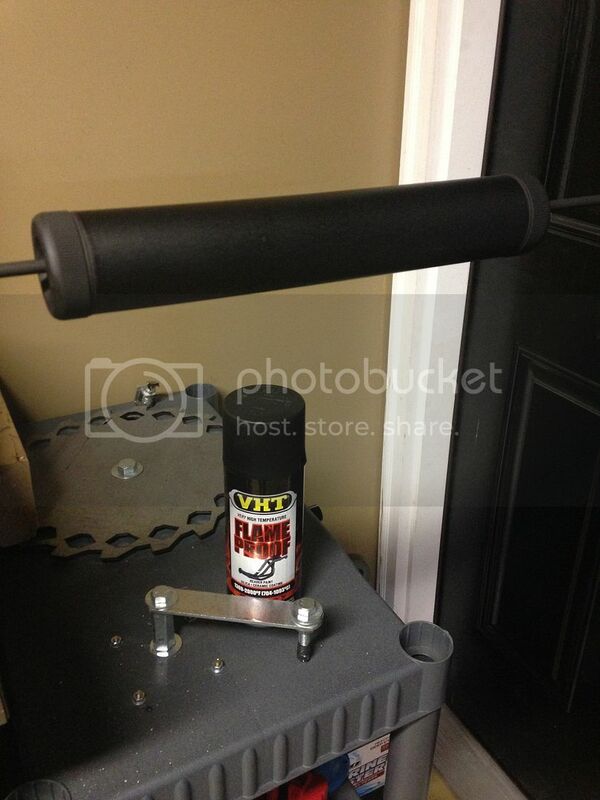 Place your blast chamber spacer in the tube, and then the end cap. Tighten it down and make sure everything is tight and compacted inside. 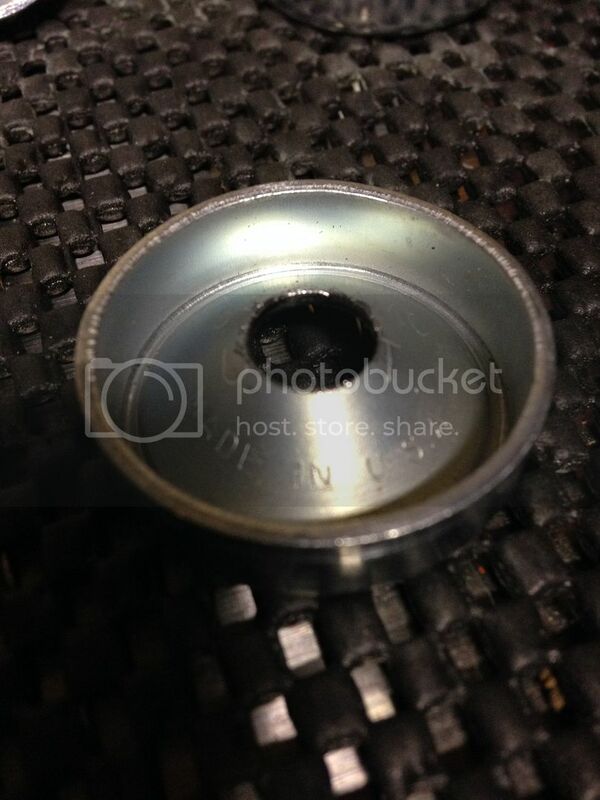 Make sure there is no movement of the internal parts, and you can see through the can with no obstructions. 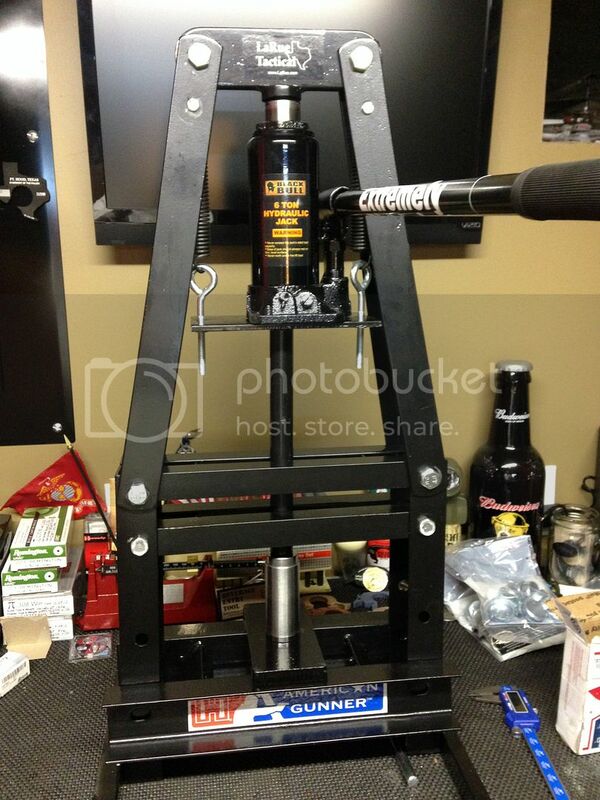 If you have a bore rod, stick it in to check the alignment. You can finish your can with what ever you choose. I'm using high temp header paint. 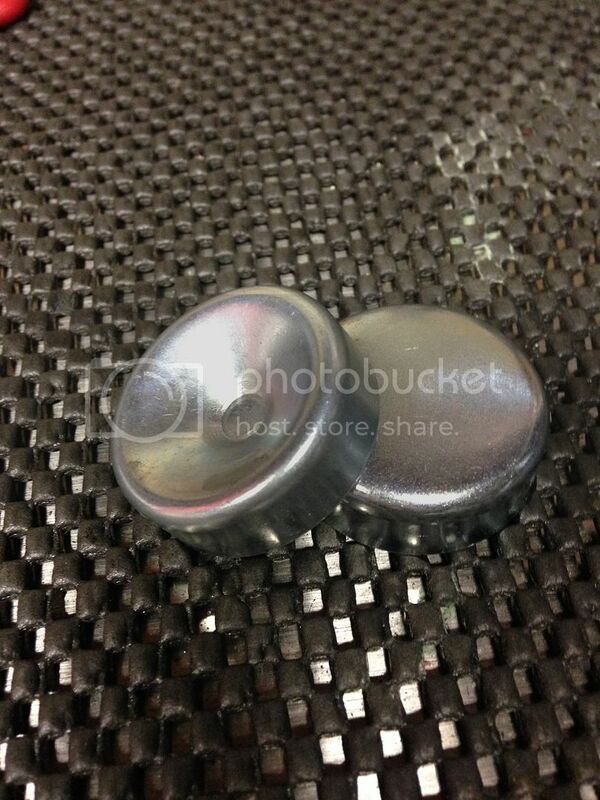 I have already coated the can prior to assembly, following the instructions on the paint can. 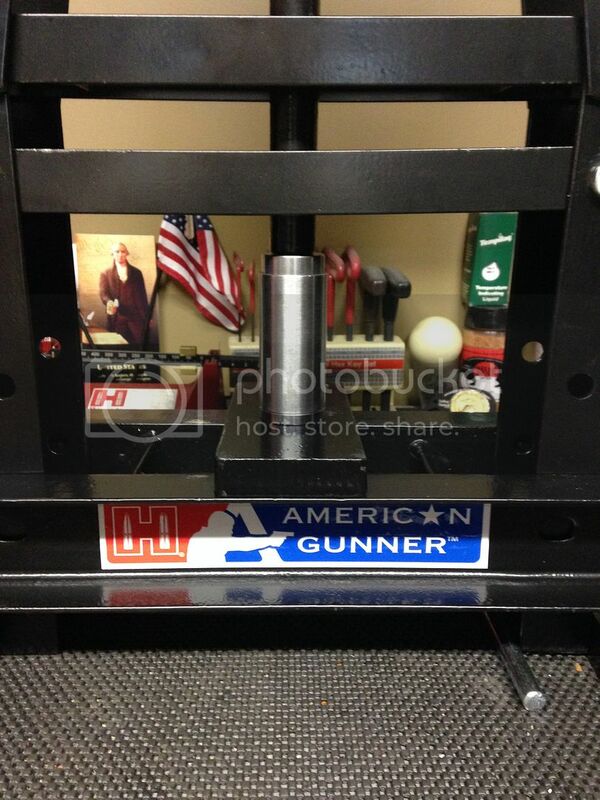 Your Form 1 suppressor needs to be properly marked per the ATF. Some guys do their own since it doesn't cost anything. 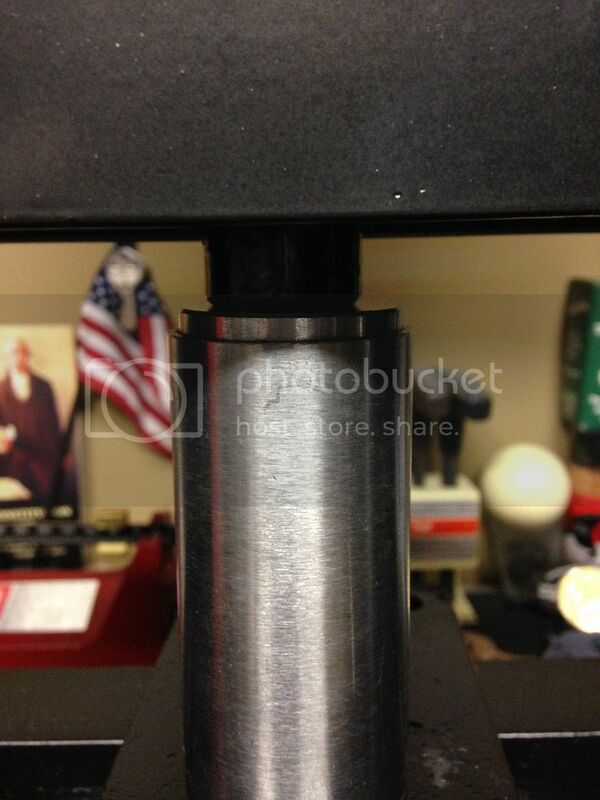 You can engrave it or stamp it, but it needs to be .003 deep. You should have the trust name, city and state, model, serial, and caliber all as they appear on your paperwork for the approved stamp. Since I have a titanium tube, and I'm not very good at engraving I decided to have mine done by a professional. A local jewelry shop quoted me $50, online places are $35-$50 plus shipping. Follow all laws on proper placement, script type, etc. Last edited by Weber; December 28th, 2015 at 03:17 PM. Create your account and login. 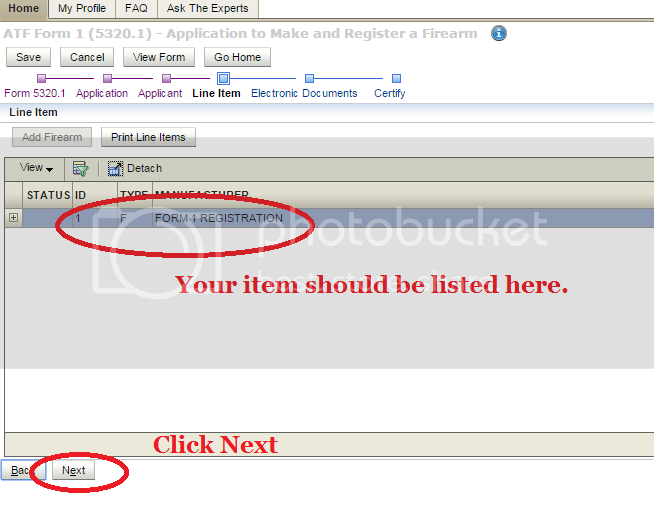 Once inside, scroll over to Form 1 and click it. Down at the bottom click "Next"
Next we select No FFL. 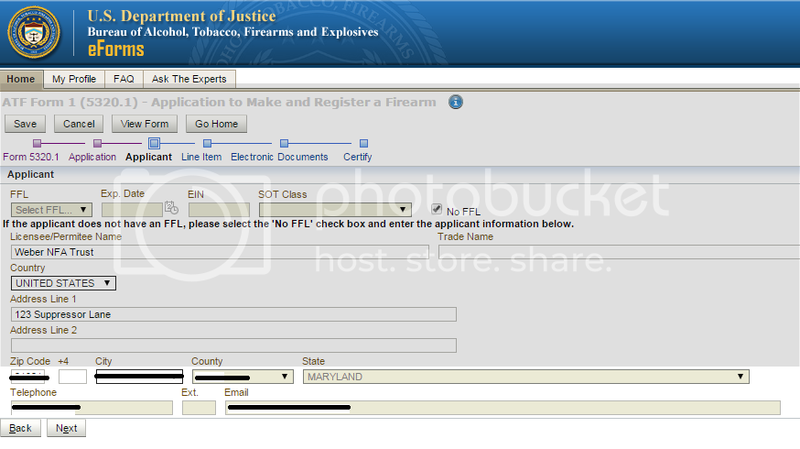 Enter the Trust Name under Licensee. 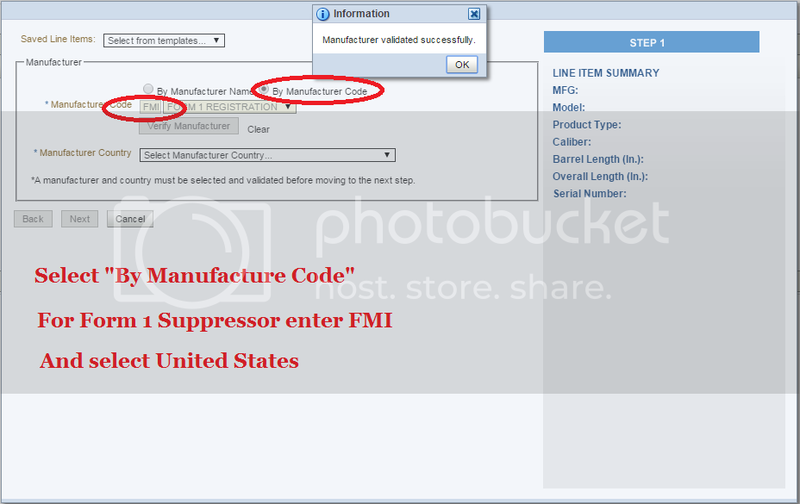 Select By Manufacture code, and for Form 1 suppressors enter FMI as the code. Then Click Verify Manufacture, and you should get a pop up that says successful. Select United States and click Next. 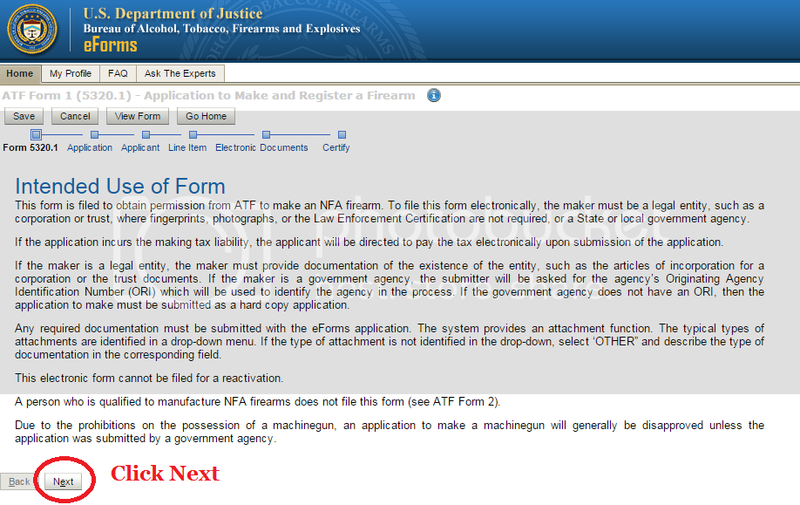 Next we enter the information for the NFA item. 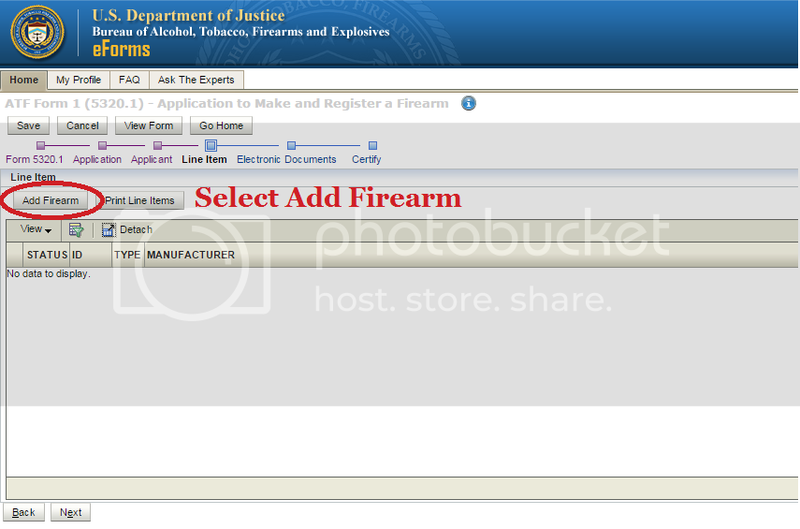 Start by selecting Add Firearm. 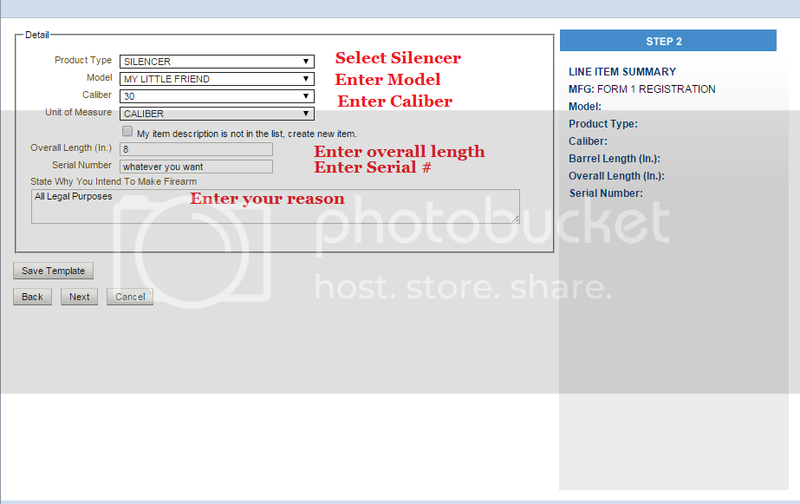 Select the Silencer from the drop down. Enter the model, selecting one on the list will decrease the wait time, but you may enter what ever you want. Select the caliber, and the unit of measure. Then add why you intend to make this item. I always use "All Legal Purposes" some guys like to have fun with this field. The next screen we do not use, this is used for other items where plans are required. Just click Finish. Now you should see your item on the screen, click next. Here is where we add our trust to the Form 1. Click choose file, and select your file. It needs to be smaller than 3MB. 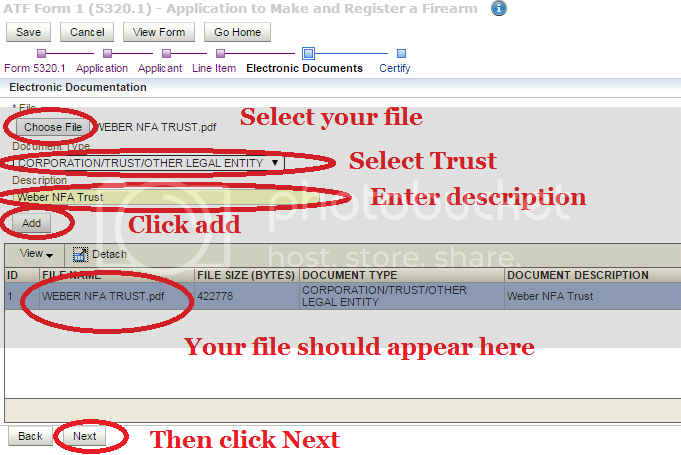 The select trust as the document type, and enter a description. Once you click "add" you should see your file. Your status should show that your application has been validated successfully, and you now check the box and click the payment screen. 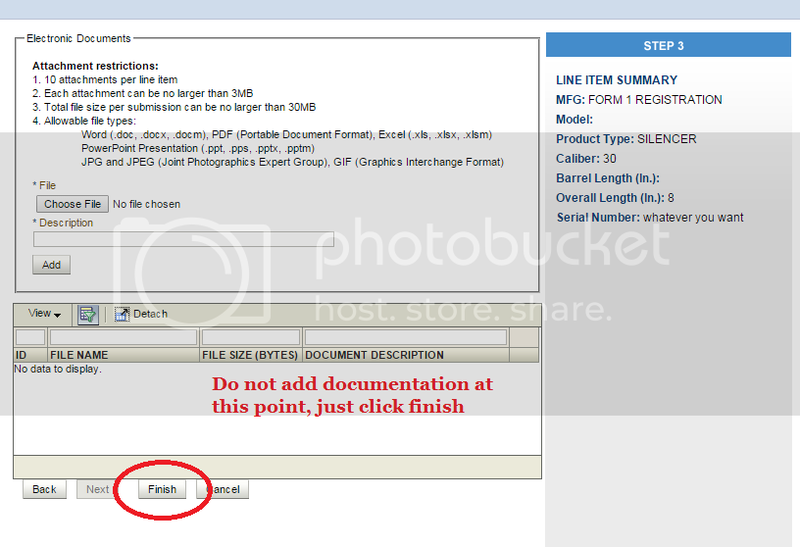 If you selected a model and caliber combination that was not listed and you selected the "My item description is not in the list, create new item", you will see the alert message in the picture below. 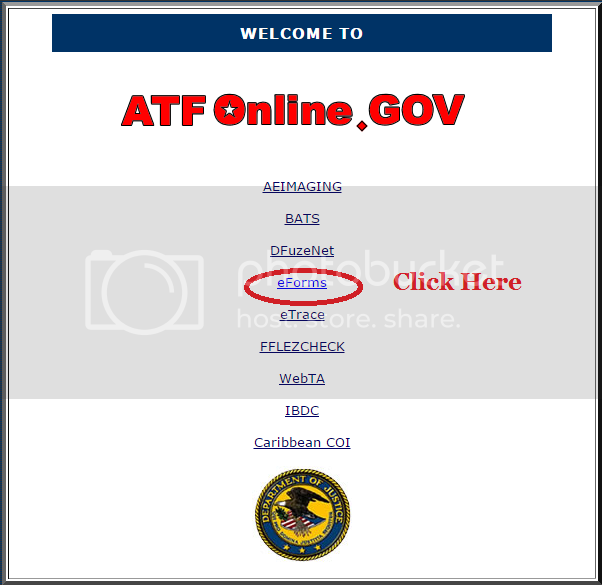 This is not a problem, but the ATF will need to validate your model and caliber selections prior to changing your status to submitted/processing. This may add a few days to your wait time, but is not an issue. Continue as normal. Follow the process for the payment, pay with a credit card. If everything went through properly you should see this screen. 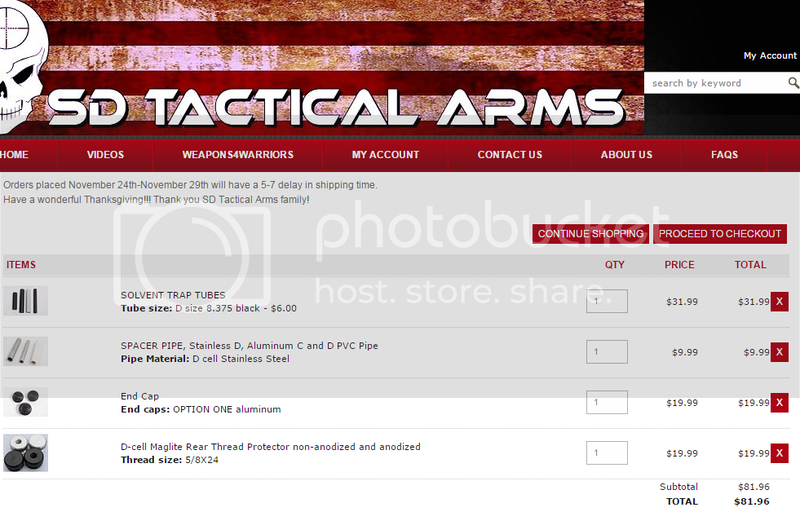 It will bring you back to this screen and you can now select Sign & Submit. It will ask you to enter your username and password to electronically sign the document. 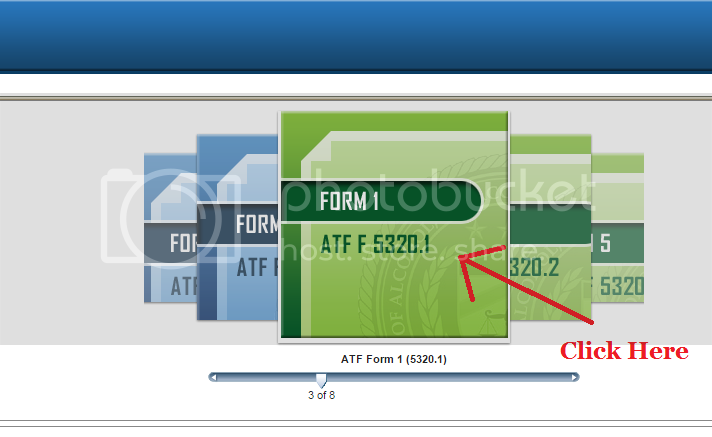 You should now see the "submitted/in process" under my forms, which you can select and then see Form 1 under it. 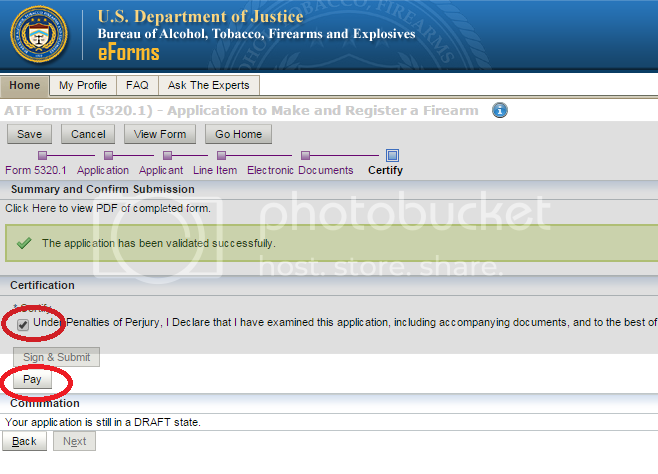 Click Form 1 and it will bring up your application that is in process. If not, it may be pending for validation due to your model and caliber combination. Last edited by Weber; February 25th, 2016 at 08:31 AM. Nice! Once I get a trust I'm really interested in building my own can. I'm glad to see this info is back. I submitted a Form1 after reading WEBER's thread here and also several other threads on the web. 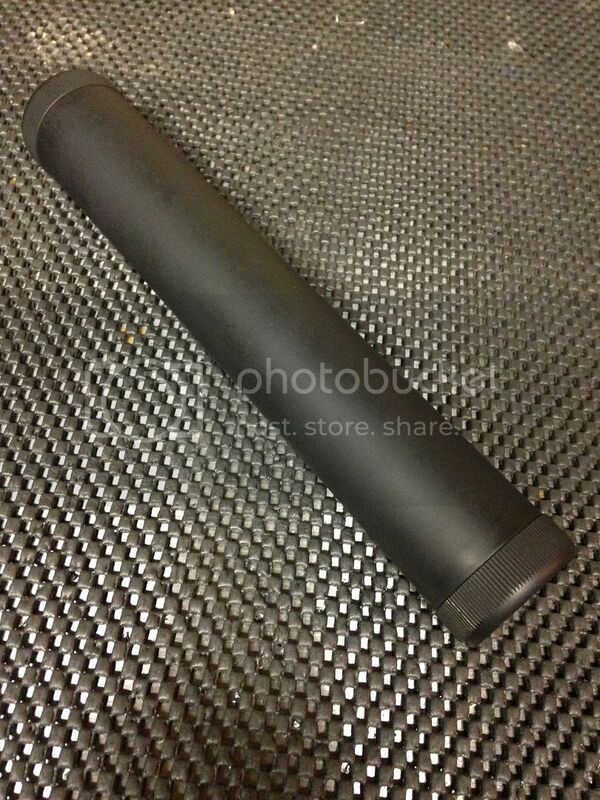 Is there any kind of comparison for this versus a commercially produced suppressor? Just side by side, they are very close overall some cases better some not as good. 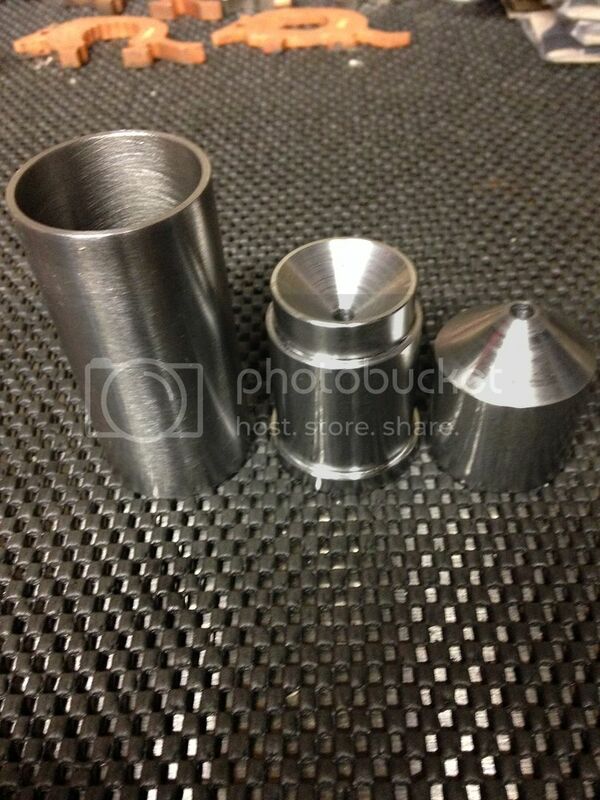 Also, how do you cut the titanium tube? 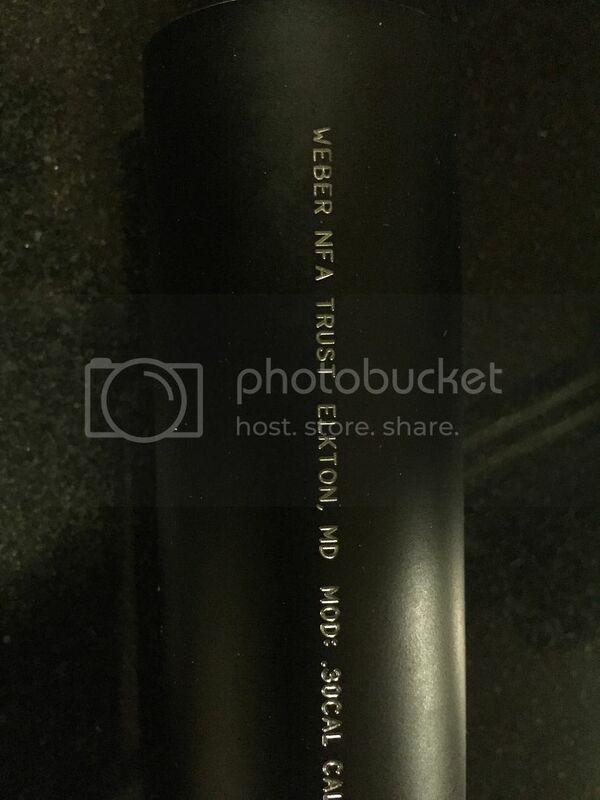 The titanium tubes listed on the site don't come in 8". 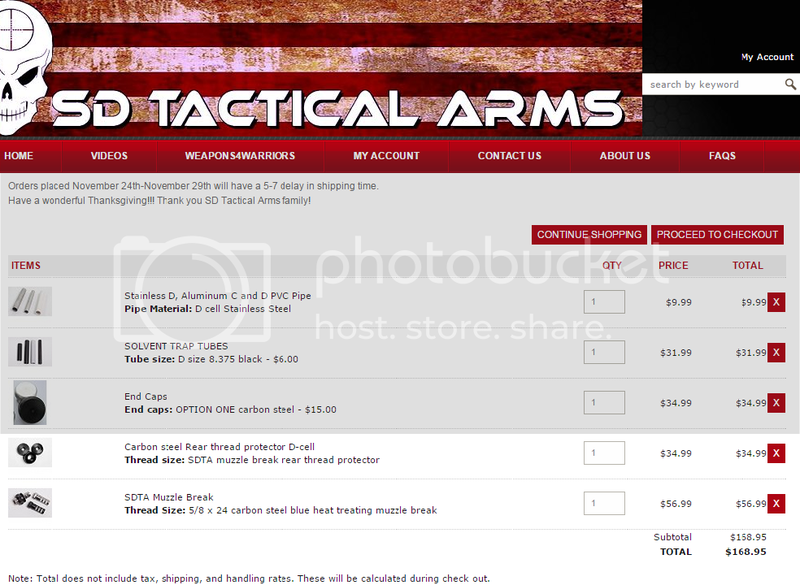 The site says "the new titanium tubes come in sizes X Y and Z". Would it be any different using the 7.6" tube?